Polish statesman and patriot; born in Warsaw Jan. 14, 1770; died in Montfermeil Castle, near Paris, July 15, 1861. After the final partition of Poland Czartoryski and his brother Constantine went to St. Petersburg in 1795 and entered the service of the Russian government. The prince became the intimate friend of Grand Duke Alexander, and when the latter ascended the throne, Czartoryski became assistant to the minister for foreign affairs. When his aspirations for the restoration of Poland by the aid of his friend, the emperor, proved futile, he became the bitter enemy of Russia and was at the head of the Polish insurrection of 1830-31. After the failure of the last effort for the liberation of Poland he went to Paris, where he was recognized as the leader of the Polish refugees until his death. Czartoryski was generally friendly to the Jews. In his early career he was the protector of the Jewish scholar Mendel Levin (Satanover), whom he engaged as teacher for his children. As a member of the commission appointed by Emperor Alexander I. (1804) to prepare the enactment of Dec. 9, 1804, concerning the Jews (see Alexander I. of Russia). Czartoryski did not, as alleged of him, work against the interests of the Jews. As a Polish patriot he was concerned mainly with the welfare of Poland, his zeal on behalf of the Jews of Poland being none the less genuine though subordinate to his main object. In later times, mainly through the efforts of Jean Czynski, and other Polish patriots who pointed out the hopelessness of liberating Poland without the help of the middle classes and of the Jews, the prince became an outspoken champion of the emancipation of the Jews. 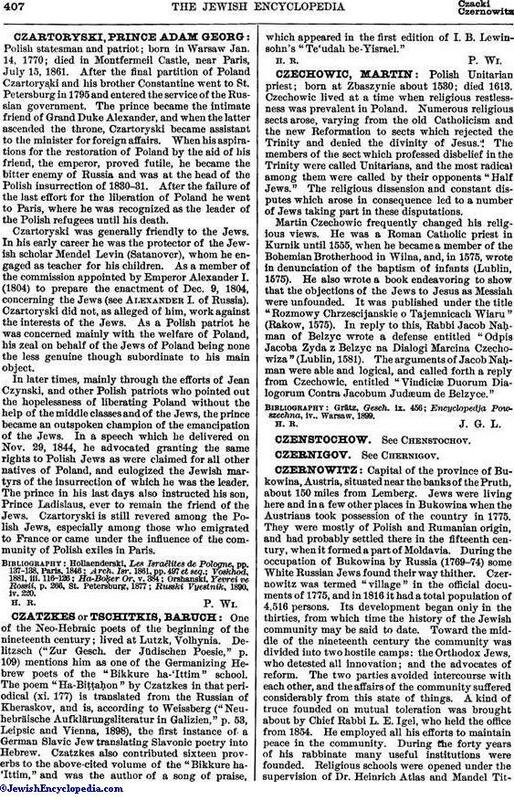 In a speech which he delivered on Nov. 29, 1844, he advocated granting the same rights to Polish Jews as were claimed for all other natives of Poland, and eulogized the Jewish martyrs of the insurrection of which he was the leader. The prince in his last days also instructed his son, Prince Ladislaus, ever to remain the friend of the Jews. Czartoryski is still revered among the Polish Jews, especially among those who emigrated to France or came under the influence of the community of Polish exiles in Paris. Russki Vyesinik, 1890, iv. 220.